Nobody loves it when the party is over, especially when the party is a significant cultural event. As part of the POPSUGAR Insights Content, Commerce, and Culture study, we surveyed over 1,500 women between the ages of 18-44 and asked them to share when they typically consume digital content related to cultural events. 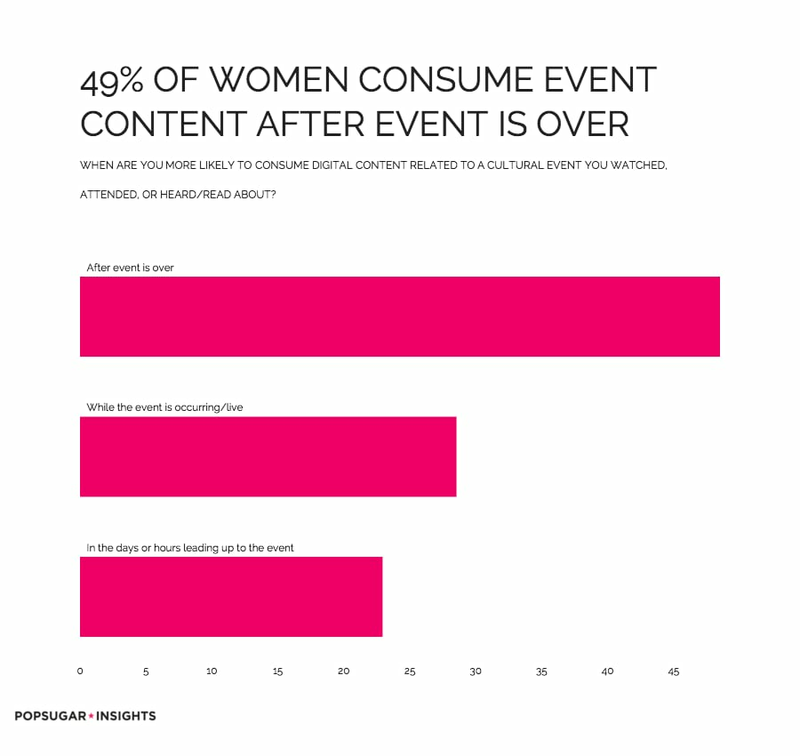 Overall, 48% of women said that they typically consume content related to a cultural event after the event has ended. Whether they missed the event live and watch to catch up on the important news, or just don't want the party to end and want to relive the best moments, this was the most popular response. Twenty-nine percent of women said that they typically enjoy digital content related to an event while the event is occurring. From live tweeting the Oscars to watching highlights of breaking event news, women love to concurrently read or watch content related to the experience while the event is still live. Finally, 23% of women said that they typically consume content related to the event in the days or hours prior to the event, preferring to soak in the anticipation about the event or learn key details about the upcoming event.